Springsoft irrigation treatment systems are designed to resolve exterior water staining and spotting. Water from well-based supplies may contain a number of different compounds which can lead to stains and deposits, with iron being the most common. Irrigation systems using this water can produce these unsightly and undesirable effects on surfaces such as walls, driveways and sidewalks, in addition to trees shrub and other landscape features. These systems consist of a metering device, a dosing pump, an in-line mixing system and a solution reservoir. A formula is added to the solution reservoir, and is then dosed into the irrigation supply. The metering device allows the dosing pump to very accurately treat the water, even as flow rates rise and fall. This is especially important for multi-zone systems where coverage and fixture count may vary. Springsoft offers formula for protecting surfaces, but also stocks a variety of products to clean stains that may already be present. In addition, ask us about special formulas that can also allow for fertilization and mosquito control. 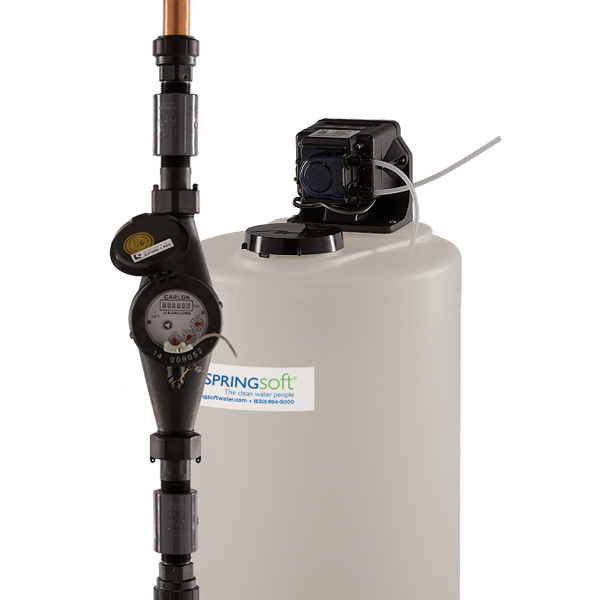 Your Springsoft Water Specialist will assist in providing proper formula, sizing and placement, as well as an on-going service plan to assure long term operation and performance.